"The dream all these athletes have is they want to be on the podium at a global championship. They want to race the best athletes and beat them on that day. It's not easy to do, and it's becoming harder, because some of the East Africans (have become citizens of) other countries now, and they're really good. We're playing a little bit of catch-up, but we're getting there. The gap is closing. We'll be there before too long." - Nike coach Jerry Schumacher talking in a great profile of him in the Portland Tribune. American distance fans will get to see how Schumacher's boys (and many of the other top Americans) stack up against many of the world's best early in 2011, as a slew of dream races will take place over the next month. Yesterday, Bernard Lagat was added to the Melbourne 5k on March 3rd, so three of the five Americans under 13:00 in history will all clash early in the year. How long would the line be at the Nairobi airport if we said we had $6,200 to anyone that could run 8:48 for 2 miles? 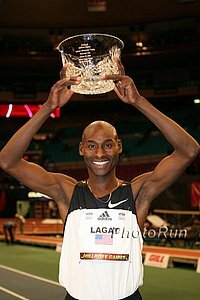 This Week: "North American Dream Mile"
LRC Preview Bernard Lagat To Go For US Two-Mile Record On January 12th At The Armory It's worth noting that Doug Padilla didn't even know he still had the record (8:15.02). It's also worth noting that Robby Andrews is expected to rabbit - so it looks like he's rebounding from his plantar injury. Tegenkamp, Flanagan, Huddle & Goucher Running It should be a great race. Tegenkamp, Torres, Abdi and Scott Bauhs among others on the men's side, Lisa Koll and Shalane Flanagan for the women. *Scott Bauhs Interview We didn't know he is a living legend, but there is an XC meet named after him. Oops - BYU Doesn't Have A Track Conference To Compete In The Cougars decided to go for the money and go independent in football, leaving their track teams out to dry as the conference they joined for other sports doesn't even have track. Unbelievable - Australia's 800m Record Is 42 Years Old There is some hope with David Rudisha racing down under that he'll inspire an Aussie to break the record. Dream Matchup Of Alan Webb, Nick Willis & Lukas V. Loses Alan W.
Alan Webb Out But Leo Manzano Is In New Balance Mile This Saturday In Boston Also NCAA XC champ Sheila Reid, who just ran 8:56 for 3k last weekend, is in the ladies mile and will be going for the 'Nova record of 4:28.31. In the 3k, Mo Farah will now face double NCAA XC champ Sam Chelanga. Bershawn "Batman" Jackson also is running. Penn State's Ryan Foster Is First Tasmanian To Break 4-Minute Mile & He's Pumped About It As Well Foster: "People back home and particularly my family might not understand some of the things in the USA, like being an All American or competing at Big Ten titles, but a four-minute mile, to all my family, will make them pretty excited." Ryan Crouser Destroys Indoor HS 16lb Shot Record By 3 Feet Crouser started using the spin technique for the first time in competition, throwing a US #2 all-time 73-1 with the 12-pound high school shot, and then set the US high school indoor record with the 16-pound implement, throwing 63-11. That makes him No. 2 all-time, behind Michael Carter, who threw 67-9 outdoors 32 years ago and if he was in college he would have hit the NCAA auto mark. Jodie Williams Sets European Age-17 Best In 60m The World Junior 100m champ ran 7.28, which would rank her 7th in the NCAA so far this year. Some Countries Actually Put Track On TV! 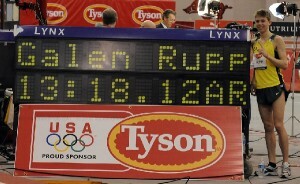 France will broadcast at least 20 hours of live footage from 2011 European Indoor Championships. Marrakech International Marathon Recap 2:10:22, 2:37:00 get the job done. Millrose Behind The Scenes: Lagat Goes Down, Millrose Entertains Employee #1 and his able assistant went into the bowels of Millrose to tell you what really happened at the grand-daddy of track and field meets in the world. High schoolers flashing U of O symbols, overlooked 3:34 1,500m runners, and pros addicted to LetsRun.com, we've got it covered. IAAF Secures Over-The-Air TV Deal In France The IAAF is making it a priority to get the sport on TV channels people actually watch instead of obscure cable channels for a few $. Tokyo Marathon: 27:01, 59:50 Guy Gideon Ngatuny To Make His Marathon Debut In Tokyo, Taking On Gebrselassie The marathon is March 9th February 27th. We like the clever website name: www.tokyo42195.org . Usain Bolt's London Uniform Will Be Designed By Bob Marley's Daughter Hopefully it's not contaminated with second-hand smoke. Russia's 800m Runner Yuliya Rusanova Is First Woman Under 2 Minutes In 2011 1:59.44 in Belgorod on Saturday. Najee Glass Will Take Another Stab At The 500m Record A special 500-meter race has been added to the New Balance Collegiate Invite at the Armory so he can take another shot at it after he was DQed for running out of his lane at the New Balance Games. Top 5: Excuses Used For Failing A PED Test You know these are the guys who used the "My dog ate my homework" excuse back in grade school. Aisling Cuffe: Gatorade 2010 National Girls XC Runner Of The Year Gets Surprised By Allyson Felix We're not sure what a sprinter and distance runner have in common - it's sort of like the national quarterback of the year getting an award from Clay Matthews (we just wanted a random Super Bowl reference on the homepage today). British Athletics Clubs Group Comes Out Against Keeping Olympic Track In Stadium They say a 60,000-seat stadium for track isn't necessary and will be ripped out anyways in a few years. Greg McMillan And Crew Reflect On 2011 Chevron Houston Marathon Nick Arciniaga & Stephanie Rothstein impressed in a big way while Brett Gotcher had a "tough day at the office."